If you live in the middle of a big city, chances are you are currently enjoying internet download speeds on the order of 100 Mbps, 200 Mbps, or even 1 Gbps in some areas. But for the rest of us – especially those who live out in the country – it’s often nearly impossible to get any kind of good high-speed internet connection. Well, it just so happens that there is a solution to your internet woes, but a little luck and some homework is needed! As you can see, with wired internet, your bits travel across phone lines, coax, or fiber. The system is “wired”, and therefore the latency is much lower. Latency is basically the delay between when you say, “Gimme this!” and the time you actually get it. So, a low latency connection feels much faster, because you don’t sit around waiting for that web site to load. You click, and in a flash, it’s downloading. Satellite internet is high latency, which means you wait longer after clicking for anything to start downloading. Once it starts downloading, it’s often just as fast as many wired connections. Why is satellite internet high latency? Easy! ScottiesTech.Info finally loads in your browser! Now, in the past, these latency numbers were much higher due to older tech, slower hardware, etc. 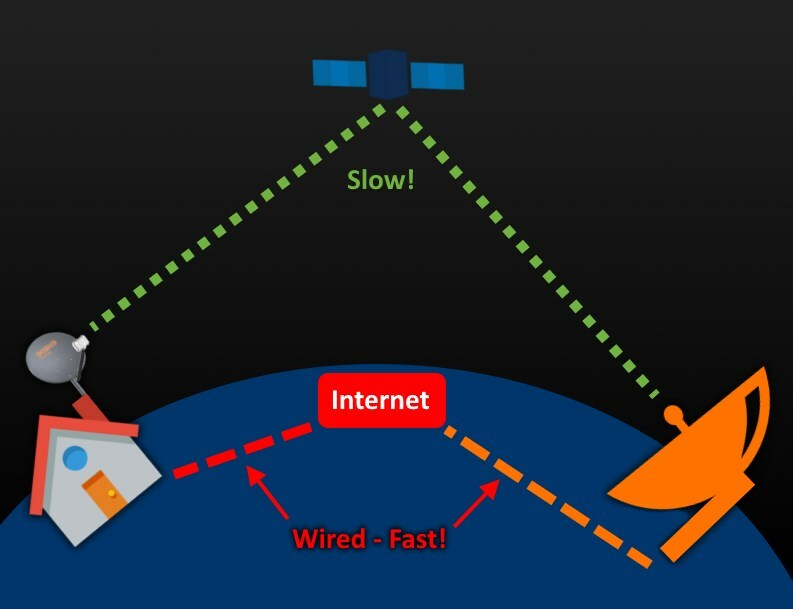 Today, technology has progressed to the point where satellite internet connections have a latency of around 500ms (half a second). Wired internet connections will have latencies measured in tens of milliseconds – aka faster! So, with satellite internet connections, you wait a bit longer. It’s not ideal, but it’s way better than 1Mbps DSL, right? But what about bandwidth caps? Ah… Therein lies the rub! Most satellite internet services offer limited total download bandwidth. What this means is that you get, say, 30GB per month. Once you pass this monthly limit, your download speed over your satellite internet connection is usually limited – sometimes severely. You may have 20Mbps down and 6Mbps up, but after your kids watch 50 YouTube videos in a row on the 3rd of the month, for the rest of the month you will be throttled to 128 kbps download speed. OUCH! This is actually the major drawback of satellite internet: It’s not the latency that kills you, it’s the limited bandwidth. You usually only get fast speeds until you exceed your bandwidth cap (which can happen VERY easily and quickly – trust me on this one). Now we get to the fun part. It turns out that sometimes, you can get unlimited bandwidth satellite internet. You have to hunt around. As far as I can see, right now there are no unlimited bandwidth satellite internet offers in the USA. But in Europe, Nordnet offered unlimited bandwidth 20/6 Mbps service to the first 1500 people who signed up. This was a few years ago, so obviously that offer has ended. But, if you live around the EU, you might be able to get (at the moment) skyDSL. Right now, their most expensive option is actually unlimited bandwidth. It doesn’t really say that on their web site though; you have to download the Terms of Service and read the fine print. In short, if you order skyDSL2+ FLAT L with the Premium option, you will get 25 Mbps download, 6 Mbps upload, and there is no bandwidth cap. Good timing is also required. Usually, these special limited-time unlimited bandwidth offers will be around soon after a new satellite is placed into service. So, if the unlimited option doesn’t exist right now, don’t stop looking! Check very few months, and be sure to research all the different providers thoroughly. And most importantly, download the Terms of Service and read the fine print! I have to add here that even satellite dish installers will tell you that there’s no such thing as unlimited satellite internet. I can tell you for a fact that this is not true, because I’m using one such service right now – and just down the street from me is another lucky user! But, like I said, you have to be patient, hunt around, be patient, hunt around again, etc. 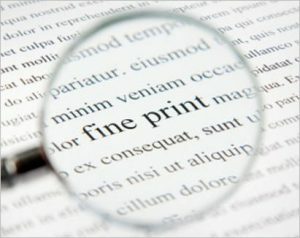 Timing is everything, and you must read the fine print – did I mention that already? Sometimes, providers will tell you it’s unlimited, but you read the fine print and it mentions throttling via a Fair Use Policy (FUP). So, be sure to check thoroughly! Call them if necessary. Note that even if you do manage to get unlimited satellite internet, there are a few things to keep in mind. As with all internet providers, the satellite you’re connecting to has a limited amount of bandwidth. These days, it will be on the order of a few hundred Gbps. 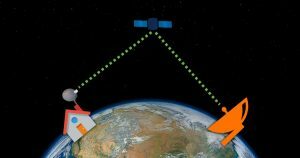 That may sound like a lot, but there are many users, and the satellite may also be relaying data for other services. So, as with other types of internet connections, you aren’t guaranteed a specific download speed. Your speeds will vary depending on the time of day. Even if you have unlimited bandwidth, many users will mean your download speeds will drop – even if your bandwidth is not capped. That’s no different than wired connections. Also, weather comes into play – including space weather. Since the signals are being shot up to a satellite, and then back down to a base station, your connection can be slower during times of bad weather (either near you or near the base station). Speeds can also drop during solar flares and that kind of thing. Overall, it’s pretty reliable, but just keep in mind that it’s not perfect. 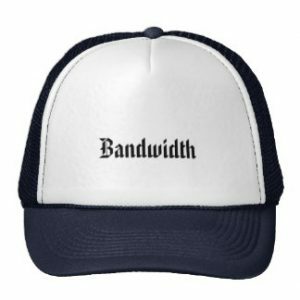 There are often other plans available when it comes to bandwidth caps – and they are usually cheaper. For example, sometimes you can get 30GB per month, but bandwidth is unlimited between midnight and 8am. These types of plans are far more common. If that works for you, go for it! It really depends on your particular needs and usage patterns. Just keep in mind that if you’re patient, and if you hunt around, you may be able to snag an honest-to-god unlimited satellite internet connection!